SIOS DataKeeper cannot function properly if the firewall settings for the source and target machines are not configured correctly. This means you will need to configure a rule for inbound and outbound connections on each server running SIOS DataKeeper as well as any network firewalls that replication traffic must traverse. During installation of SIOS DataKeeper, you will be prompted to allow the installer to configure your firewall rules needed by DataKeeper on Windows 2008 and Windows 2012. 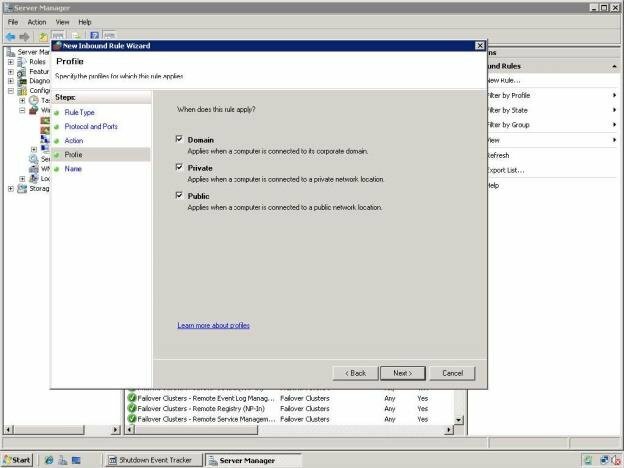 If you choose to allow the installer to make these changes, you will not need to configure your firewall manually. If you choose not to allow the installer to make these changes, you will need to configure your system manually as described in this section. The ports that are required to be open for replication are as follows: 137, 138, 139, 445, 9999, plus ports in the 10000 to 10025 range, depending upon which volume letters you plan on replicating. The chart below shows the additional ports which must be open depending upon which drive letters you plan on replicating. The exact steps required to configure the firewall for each cluster is as varied as each possible cluster configuration, but the following procedure and screen shots will give you one example to follow when using SIOS DataKeeper to replicate the E: and F: volumes. Note the Port # and Volume Letter table listings in the previous section. 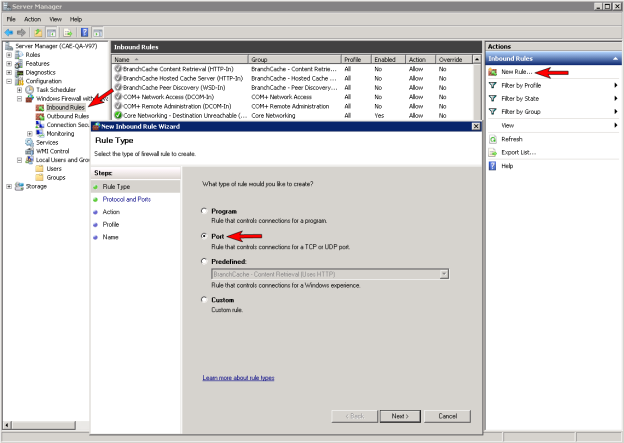 Open Microsoft’s Windows Server Manager and select Inbound Rules to create a rule for the TCP protocol as well as the UDP protocol. 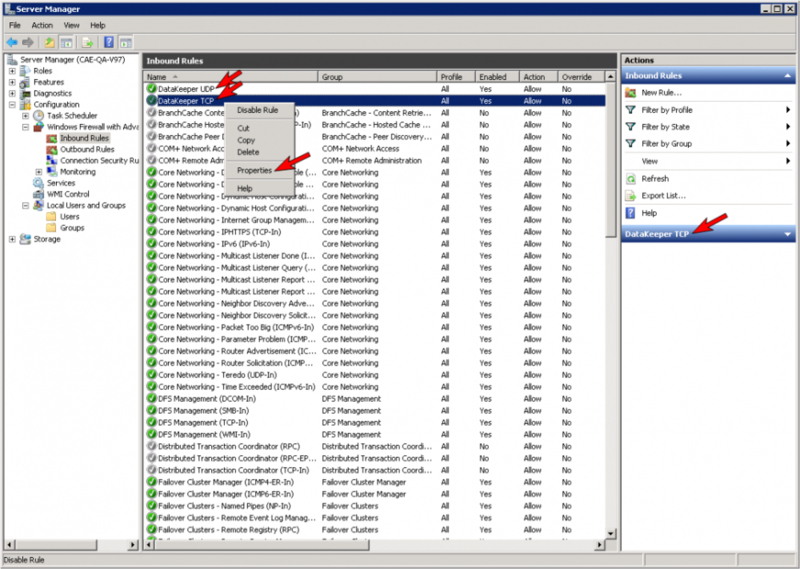 Select New Rule from the Actions panel in the right column of the window. 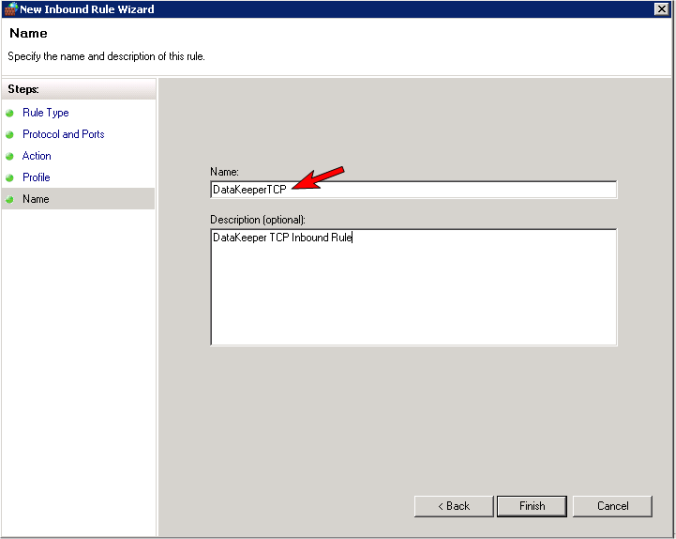 Select Port as the type of rule to be created. Select Next. Select TCP for the type of protocol impacted by this rule. Select the Specific local ports button and enter the following ports: 139, 445, 9999, 10004 (for the E drive) and 10005 (for the F drive). Select Next. For the action, select Allow the Connection. Select Next. For the profile, select Domain, Private and Public for the conditions when this rule applies. Select Next. Enter a Name and Description for the new Inbound Rule and select Finish. Select New Rule again to create the rule for UDP protocol. Select Port as the type of rule to be created. Select Next. Select UDP for the type of protocol impacted by this rule. Select the Specific local ports button and enter the following ports in the Specific local ports field: 137, 138. Select Next. Your new DataKeeper rules will appear in the Inbound Rules list and the Action panel column. You can select the DataKeeper rule in the center panel and click the right mouse button to view the rule Properties.